Colonial stage.. © Robin Raine (Robin.Raine@nuigalway.ie). Partial colony taken in phase contrast.. © Robin Raine (Robin.Raine@nuigalway.ie). 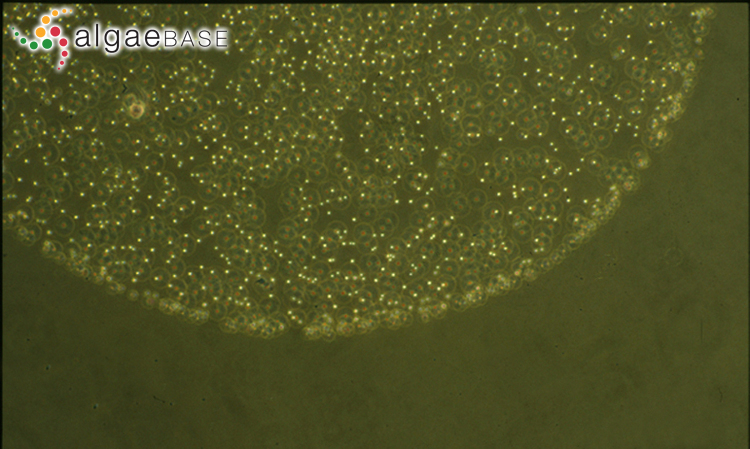 Phaeocystis globosa Scherffel Partial colony taken in phase contrast. Published in: Scherffel, A. (1899). Phaeocystis globosa n. sp. (Vorläufige Mittheilung). Berichte der Deutschen Botanische Gesellschaft 17: 317-318. The type species (holotype) of the genus Phaeocystis is Phaeocystis pouchetii (Hariot) Lagerheim. Harmful species (Lassus et al. 2017). 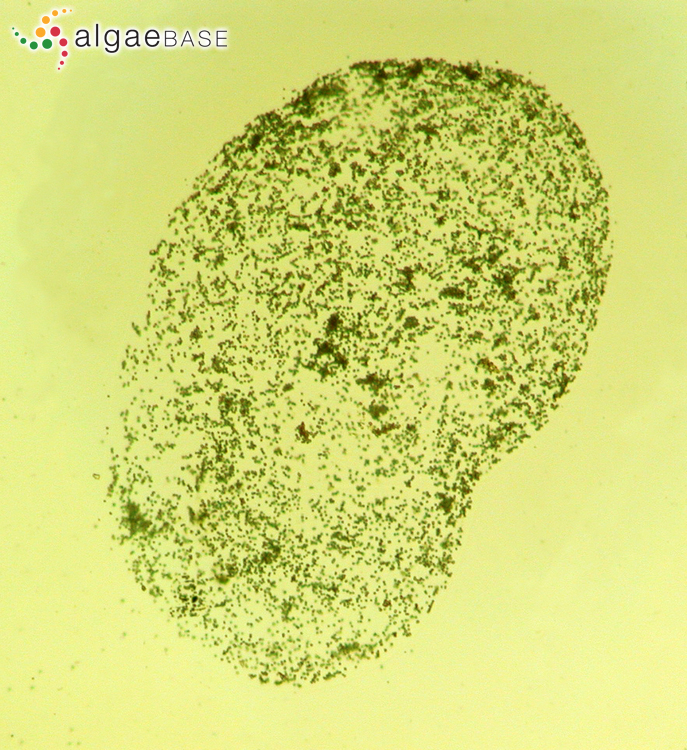 Type locality: Helgoland (Silva 1996-to date).plankton. Gómez, F. & Souissi, S. (2008). The impact of the 2003 summer heat wave and the 2005 late cold wave on the phytoplankton in the north-eastern English Channel. Comptes Rendus Biologies 331: 678. Jordan, R.W., Cros, L. & Young, J.R. (2004). A revised classification scheme for living haptophytes. Micropaleontology 50(Suppl. 1): 55-79. Kapustin, D.O. & Gerasimiuk, V.P. (2015 '2014'). Haptophyta. In: Algae of Ukraine: diversity, nomenclature, taxonomy, ecology and geography. Volume 4: Charophyta. (Tsarenko, P.M., Wasser, S.P. & Nevo, E. Eds), pp. 483-489. Ruggell: Koeltz Scientific Books. Larsen, J. & Nguyen-Ngoc, L. [eds.] (2004). Potentially toxic microalgae of Vietnamese waters. Opera Botanica 140: 5-216. Medlin, L.K., Lange, M. & Baumann, M.E.M. (1994). Genetic differentiation among three colony-forming species of Phaeocystis: further evidence for the phylogeny of the Prymnesiophyta. Phycologia 33(3): 199-212, 6 figs, 6 tables. Scherffel, A. (1900). Phaeocystis globosa nov. spec. nebst einigen Betrachtungen über die Phylogenie niederer, insbesondere brauner Organismen. Wissenschaftliche Meeresuntersuchungen, Abteilung Helgoland 4: 1-29, figs 80, 81. Schoemann, V., Becquevort, S., Stefels, J., Rousseau, V. & Lancelot, C. (2005). Phaeocystis blooms in the global ocean and their controlling mechanisms: a review. Journal of Sea Research 53: 43-66, 5 figs, 9 tables. Accesses: This record has been accessed by users 4912 times since it was created. Janse, I., van Rijssel, M., van Hall, P.-J., Gerwig, G.J., Gottschal, J.C. & Prins, R.A. (1996). The storage glucan of Phaeocystis globosa (Prymnesiophyceae) cells. Journal of Phycology 32: 382-387, 2 figs, 1 table. Peperzak, L. & Gabler-Schwarz, S. (2012). Current knowledge of the life cycles of Phaeocystis globosa and Phaeocystis antarctica (Prymnesiophyceae). Journal of Phycology 48(3): 514-517. Scherffel, A. (1899). Phaeocystis globosa n. sp. (Vorläufige Mittheilung). Berichte der Deutschen Botanische Gesellschaft 17: 317-318.
van Rijssel, M., Hamm, C.E. & Gieskes, W.W.C. (1997). 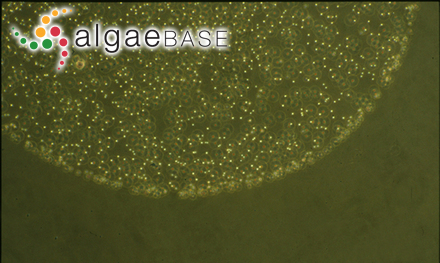 Phaeocystis globosa (Prymnesiophyceae) colonies: hollow structures built with small amounts of polysaccharides. European Journal of Phycology 32: 185-192, 7 figs, 1 table. Wang, X., Wang, Y. & Smith, W.O. Jr (2011). The role of nitrogen on the growth and colony development of Phaeocystis globosa (Prymnesiophyceae). European Journal of Phycology 46(3): 305-314.